One issue that keeps coming up around the Greek crisis is the degree of tax evasion. In the slide below I report the average Greek budget deficit per year on a decade by decade basis since the 1960s (figures on the left – calculated from OECD figures in an excellent paper you can find here). 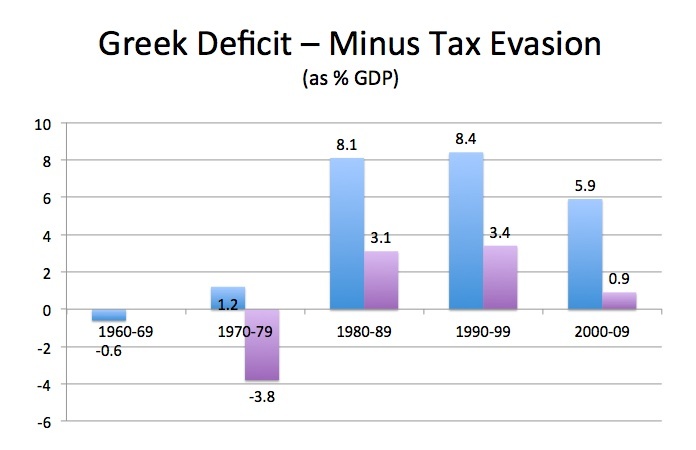 OECD has separately calculated that tax evasion in Greece constitutes about 5% of GDP. If this is deducted from the average annual deficit you get the figures for the deficit in the right-hand bar – a completely manageable level of deficit. This shows pretty conclusively that Greece’s main problem is not the size of the public sector (about average for an EU state) but the crisis of legitimacy of the Greek state which dates right back to post-war period, dictatorship and the failure to establish an accepted public administration system. 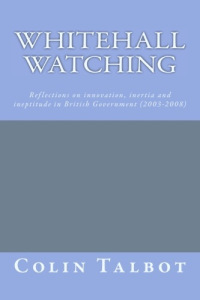 It reinforces the point I have made earlier that in countries like Portugal, Spain, Italy and Greece a major component of the current problem is the insufficient development of what I would call a ‘democratic public administration’ that can guarantee things like tax and regulatory compliance and is reasonably free from patronage and corruption. Tax evasion is just a symptom of this failure. It’s a bit of a leap from stating “fixing tax evasion would fix the budget deficit” to saying that the Greeks have failed “to establish an accepted public administration system.” One could similarly argue that the role of the church ran counter to the state; that the lack of an educated civil service class undermined the establishment of the infrastructure of state; that the previous dictatorship in truth hid the real economy, and misreported macro data; or that Greek people are more clever than any other people in the world when it comes to tax evasion. The legitimacy crisis that you speak of is only an issue when it comes to the economy, and specifically tax collection. It was never an issue (that I’m aware of) in dealing with Cyprus, nor in dealing with the EU, and its accession to the Eurozone. The state represented its people well, and expressed the general will. That said, I agree with your conclusion. But it’s too big a leap to make from one chart. The expenditure side of this equation should not be forgotten. The spending both on capital and revenue calls into question the decision making process. The pension deficit was known over ten years ago and still people at much younger ages than the UK were allowed to be pensioned off. Tim, according OECD, the average effective age of retirement in 2011(without the effects of the pension reforms that took place in 2010 and 2012), in Greece was at 61.8, Germany at 61.9 and the UK was 63.6. Its just a myth that the younger ages allowed to be pensioned.